Image: L to R: Dennis Crockett, Bill Newton, Tom Van Walleghem, H Col Ted Hawthorne, Major Jim Barrett, JP Fell Pipe Band & Lieut. Gordon Barrett. 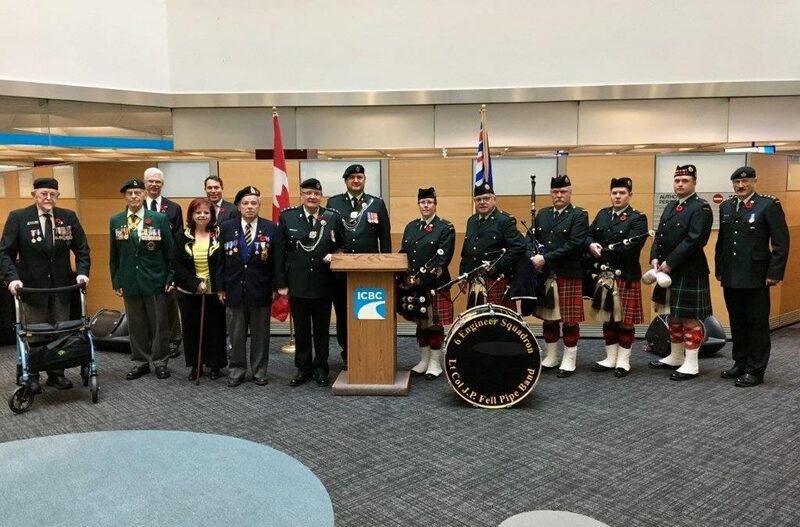 BCVCA members attended the twelfth ICBC annual Remembrance Day Ceremony on 10 November 2016. The J.P. Fell Pipe Band attended and assisted with “Last Post”, ”Lament” and ”Reveille”. Major James Barrett, British Columbia Regiment commanded the parade. ICBC kindly treated all attendees to lunch at North Vancouver’s Lonsdale Quay’s Cheshire Cheese Restaurant.